Electronic Transfer Inc Reviews - Scam? Hidden Fees? Rates? Electronic Transfer features the transaction processing merchant account center enabling customers to complete credit card payments with a variety of options. 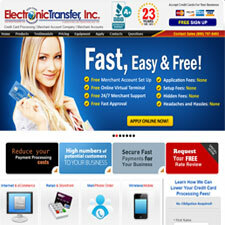 Electronic Transfer offers point of sale terminal card processing, wireless transaction processing, and an interesting touch tone phone call in processing for payments via a phone anywhere in the domestic U.S. Internet payment processing with the traditional software packages ensuring security and fraud protection for your credit card using customers and all with a free live demo of there transaction system, which I particularly liked. Low discount rate options and low rate transaction fees make Electronic Transfer Inc services an appealing provider for credit card processing for an online business.